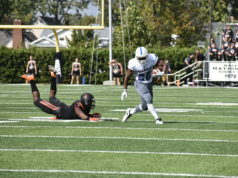 The Hillsdale College Chargers football team won its sixth con­sec­utive game on Sat­urday, 28 – 9 against Walsh Uni­versity. With the win, the team improved to 7 – 1 this season and 6 – 0 in the G-MAC. The win also pro­pelled the team into the national NCAA Division II rankings for the first time, at No. 25. The national ranking is the first time the Chargers have been ranked since late October in 2012. With three games remaining this season, the Chargers have a chance to win 10 games for the first time since 2009. The Chargers also come in ranked seventh in their region this week, which has impli­ca­tions for the team’s playoff chances. The top seven teams from each of the four regions make the NCAA Division II playoffs at the end of the regular season. Hillsdale’s last playoff appearance was in 2010. 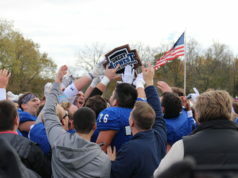 Head Coach Keith Otterbein said the team’s chem­istry has con­tributed to this year’s success. The Chargers entered the season ranked third in their con­ference. They’ve since defeated the conference’s two favored teams, then-No. 12 Ohio Dominican Uni­versity on Sept. 15 and the Uni­versity of Findlay on Oct. 6. Both wins came on the road, where the Chargers are 4 – 1 this season. 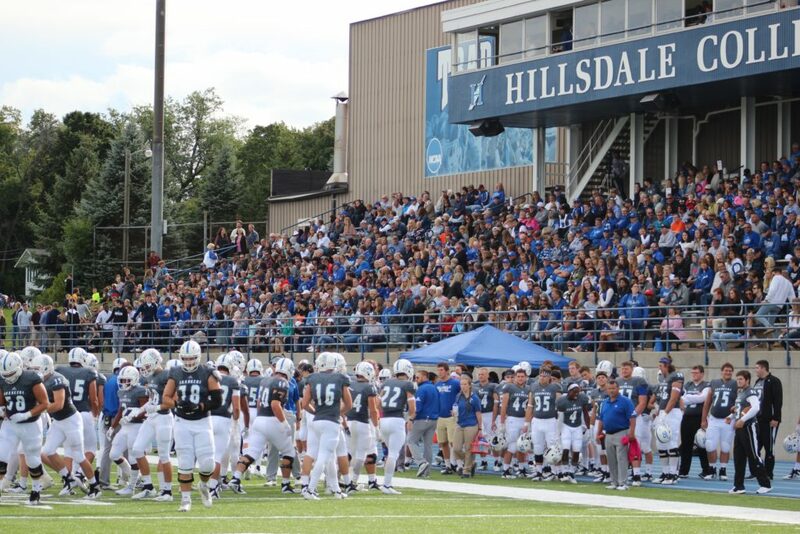 Hillsdale’s last two con­ference games are both at home, where the team is 3 – 0. The Chargers have been close to cracking the top 25 rankings as the season has pro­gressed, and Otterbein said the team was slightly sur­prised they didn’t receive the recog­nition after the win against Ohio Dominican. Nev­er­theless, senior quar­terback Chance Stewart said the ranking is unre­lated to the team’s ultimate goal. Stewart is one of many seniors on the team who have never been on a Hillsdale team that has entered the national rankings or made the playoffs. Sophomore wide receiver K.J. Maloney said it is rewarding for the team’s vet­erans to be rec­og­nized in their senior seasons. Otterbein’s message to the team this year after each win has been “this win makes the next one bigger.” The Chargers play Ken­tucky Wes­leyan College at home on Sat­urday. The team’s final con­ference game of the season is the fol­lowing week, against Tiffin Uni­versity. 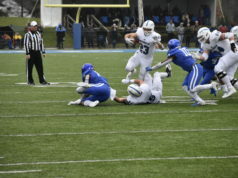 Hillsdale and Tiffin are the G-MAC’s two unde­feated teams against con­ference oppo­nents, meaning the matchup could decide the con­ference cham­pi­onship. While the team has used a com­bi­nation of an explosive offense and stalwart defense to beat oppo­nents this season, Stewart says the Chargers have yet to play their best football. Otterbein said the team has been focused on the week to week process instead of looking ahead to what could come. Hillsdale’s next oppor­tunity is this Sat­urday. The Chargers defeated Ken­tucky Wes­leyan last season, 56 – 0. Their final two oppo­nents, Tiffin and the Uni­versity of Indi­anapolis, are both nationally ranked. But now, so are the Chargers. I’m really pleas­antly sur­prised at how well the program is doing this year, I expected it to be a rebuilding year. Two sectors have really improved-the Offensive Line which gives Stewart the pro­tection and time he needs to com­plete plays and the Defensive Line. The DL is par­tic­u­larly good at stopping the run and putting opposing teams into a position where they have to pass. Right now it looks like the home contest against Tiffin is for all the marbles, but Hillsdale can’t overlook Ken­tucky-Wes­leyan. I expect a big game this sat­urday! Coach Otterbein points to one sta­tistic that stands out in the team’s success this year: turnover margin (Hillsdale is +12). They’re taking care of the ball and taking it away from other teams. Great point. Chance is a big part of that, he’ll take the sack every time rather than try to force a pass into tight cov­erage. Turnovers are absolute drive killers, it’s always better to take some lost yards than try and make some­thing happen that isn’t there. At the worst, you punt the ball away on 4th down and give your Defense an oppor­tunity to win the ball back. A turnover results in points for the other team probably 50% of the time. inter­esting. Important to note that ball control is rarely static yoy or even within the same season. Turnover luck has a ten­dency to regress to the mean. Hope­fully they can gameplan away from this to finish the season strong.